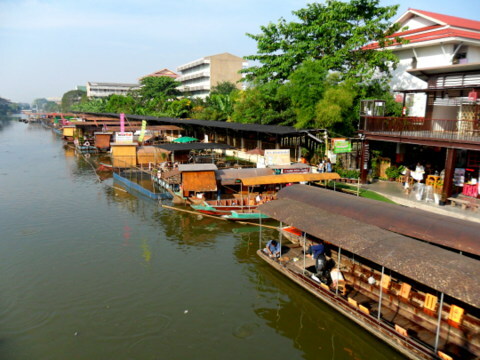 The Kwan Riam floating market is a Bangkok floating market located in Ramkhamhaeng Soi 187 on a stretch of the Saen Saeb canal between Wat Bamphen Tai and Wat Bamphen Nuea at the eastern end of Bangkok. 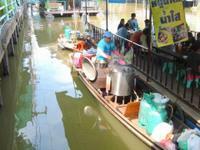 This is Bangkok’s newest floating market opened since the end of June 2012. At the time of writing this article in January 2013, it’s barely seven months old. 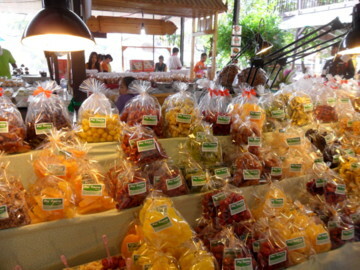 It is one of the two Bangkok floating markets in the city proper, the other being Taling Chan floating market. 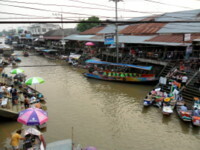 The other markets frequently referred to as Bangkok floating markets are actually in neighbouring provinces. 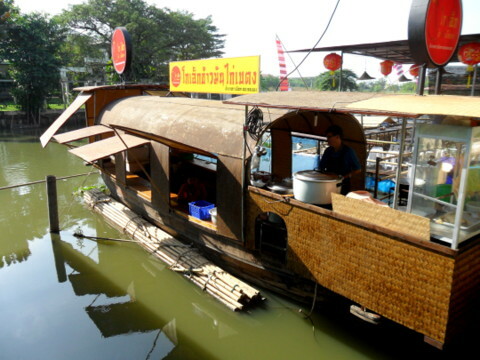 This floating market was a specially constructed floating market and looks quite well planned. 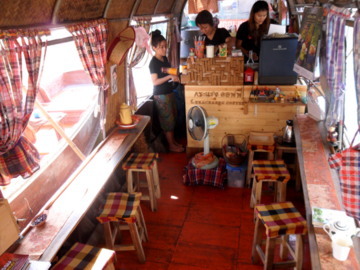 The owner also operates the Saen Saeb canal boat service between the city to Bang Kapi. 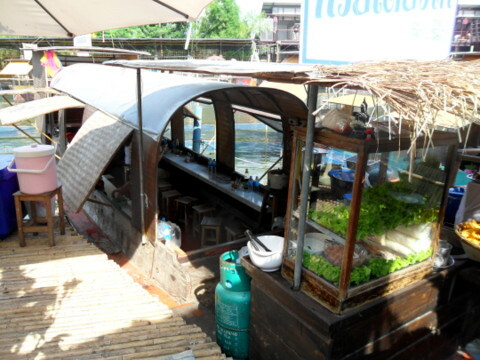 Unfortunately the boat service doesn’t extend to this stretch of the Saen Saeb canal. The place has a very local flavour; I didn’t see any tourists during my visit. 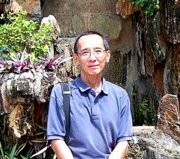 In the reign of King Rama III (1824 – 1851) Siam engaged in a long and costly struggle with Vietnam for control over the Cambodian court which resulted in two wars in 1832/33 and 1845/46. To facilitate the movement of troops in those days, thousands of Chinese labourers were conscripted to dig the Saen Saeb canal. The canal stretches from the city centre at the base of Wat Saket, the Temple on the Golden Mount to the Bang Pakong River in Chachoengsao province, a distance of about 60 km. The general who led the Siamese to final victory was Chao Phraya Bodin Decha. 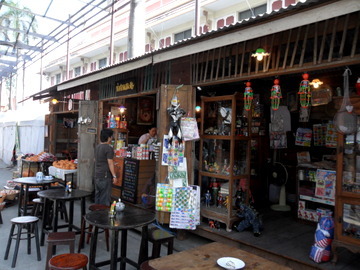 The Chao Phraya Bodindecha Museum in a traditional Thai teakhouse, barely 600 m from the Saen Saeb canal, is in the grounds of the Bodindecha School in Ramkhamhaeng Soi 43/1. 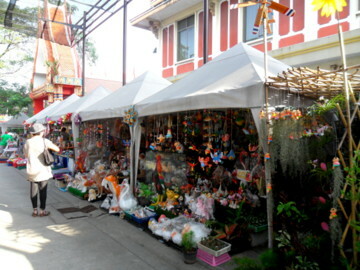 Shops selling curios, souvenirs and other decorative toys line the road approaching the floating market. 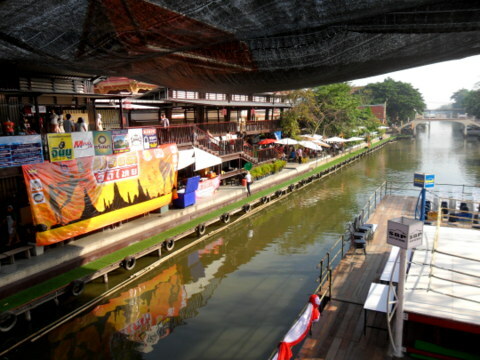 At the floating market itself, shops and stalls selling food, clothing and souvenirs line the banks of the canal. 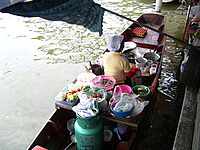 Boat stalls selling a wide variety of food are moored on both banks. 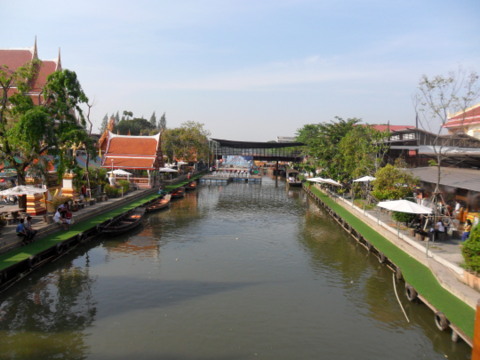 A bridge spans the canal linking the two sides of the floating market. This bridge is a favourite spot for souvenir photos and it’s also a good vantage point for photos of the floating market. 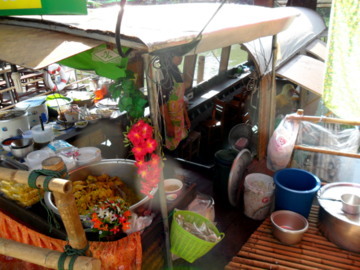 In other Bangkok floating markets the boat stalls are smaller just enough for the food vendor and his or her wares. 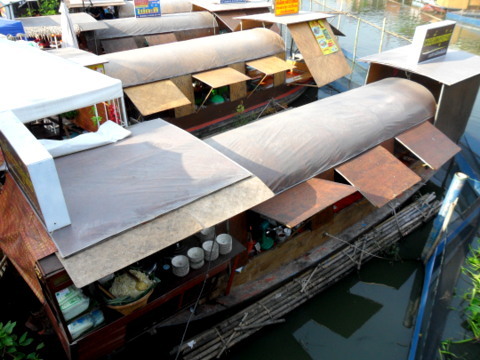 However at the Kwan Riam floating market the boat stalls are large enough to seat the customers on board. 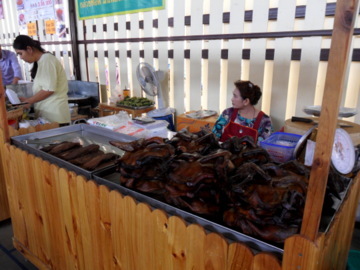 Here’s what you can expect as you stroll through the various stalls in the Kwan Riam floating market. 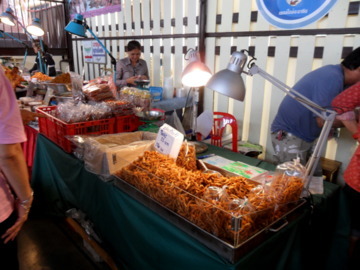 Most of the food stalls are on the north bank, the side where Wat Bamphen Nuea is located. 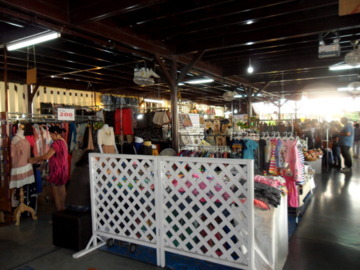 Besides food, there are plenty of stalls selling clothing. 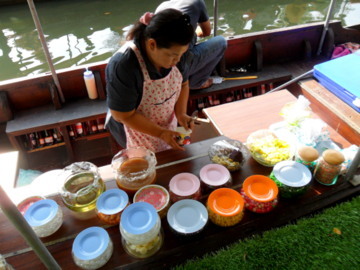 Sample the food in the boat stalls moored on the north bank. 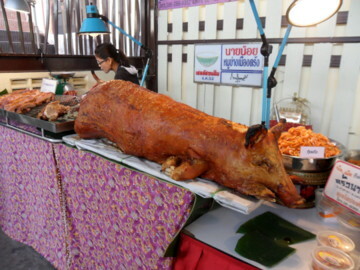 Have you seen such huge mortars for som tam? He must be expecting a big crowd. 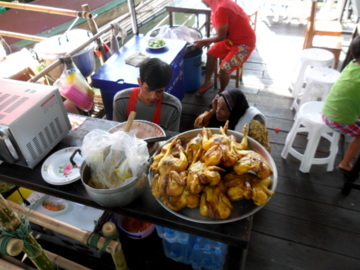 As the Ramkhamhaeng area has a sizeable Muslim population, Muslim food is available in the boat stall sector on the north bank. 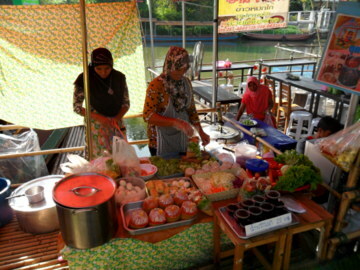 Dishes like khao muk gai (nasi briani in Malay) and salad kaag (gado gado in Malay) are served. 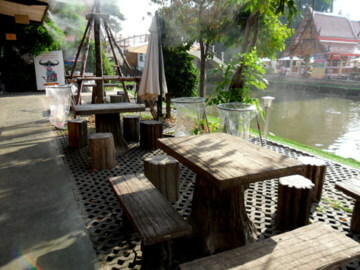 There are seats on the banks of the canal for those who prefer to dine on land rather than in the confines of the boat stalls. It was a Saturday morning during my visit so it was relatively quiet. 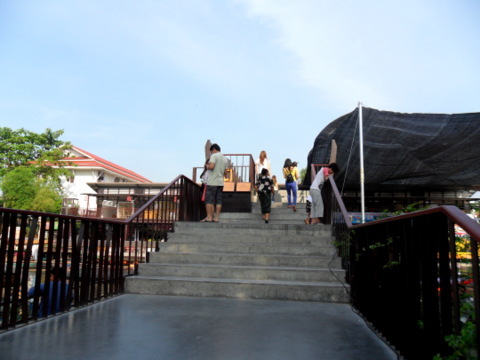 It could get crowded in the afternoon or on Sundays and the narrow walkways will be congested. So if you prefer a leisurely visit, Saturday mornings will be a good time. 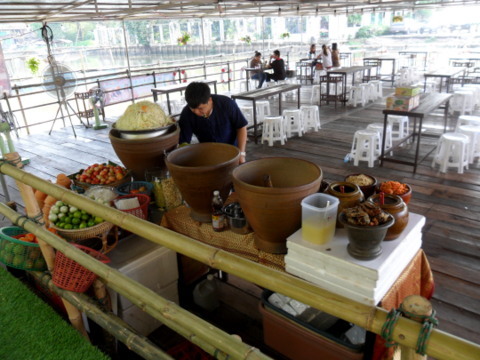 This floating market is noticeably neat and clean and well-organised. 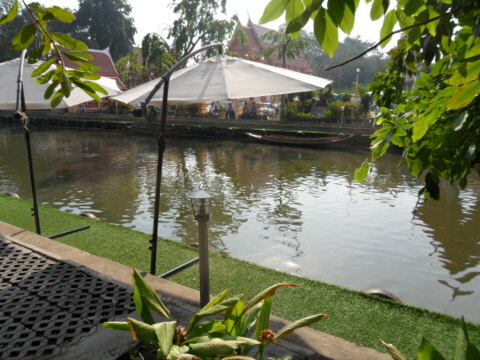 This part of the Saen Saeb canal is relatively clean compared to the canal in the city centre. For visitors who wish to give alms, the monks from the two temples, Wat Bamphen Tai and Wat Bamphen Nuea pass the floating market in boats at 7:30 am on opening days. 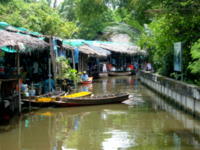 There are also guided boat tours in Thai on the Saen Saeb canal. Surprising, the guides on board are school girls from the Wat Bamphen Nuea School. This is a voluntary school program to give the girls practice in public speaking and build confidence. For Thai boxing fans there is a boxing ring permanently set up. Matches commence at 1:00 pm. After a mid-morning snack of barbecued pork and beef, I had this for desert, a choice of different condiments in coconut milk and crushed ice. Coffee was taken at this quaint little boat café. It was a comfortable and delightful experience and the ladies who run this café were very pleasant. 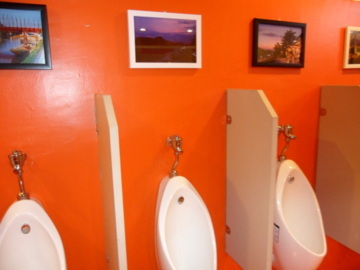 The clean toilets which are brightly and cheerfully decorated also deserve special mention. It was a very enjoyable outing at the Kwan Riam floating market on a Saturday morning, lots to eat and see in a very comfortable and pleasant atmosphere. 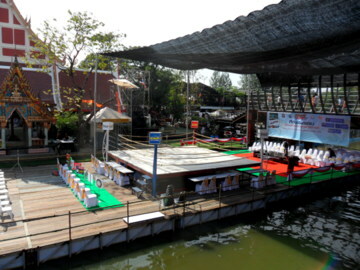 If you are driving, you can get to the floating market via Seri Thai Soi 60 or Ramkhamhaeng Soi 187. The canal boats don’t ply in this area. 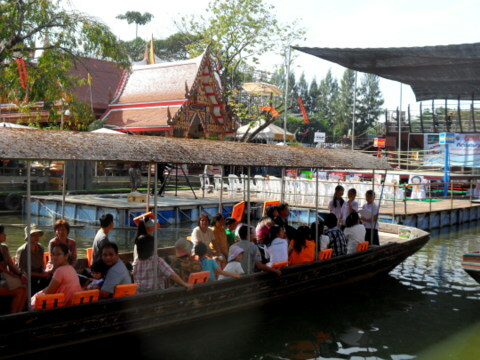 There are also several bus services from the city to the floating market.